Packing the car for a camping trip. What could be difficult about that? Well, if you have stumbled across this page, chances are you might be needing a little bit of help. Or maybe a few ideas on what you should do; or find out what you could be doing wrong. Now the beginners among you, might be the sort of campers who want to start off the right way! If so, this story is going to help you get that start in the right direction. ​Before we go too far, there is one important disclaimer. We don’t know every single vehicle on the market, nor we do know the size of your boot, if you have ability to store items on top of your car, SUV or 2WD or 4WD. There is a lot we can’t cover because we don’t know YOU! So this is general information. It’s not vehicle specific. You are going to have to modify a little to suit you, your car and your camping style. And here is another important disclaimer (or friendly advice). Car packing can be quite stressful. Tempers can fray. Opinions by others watching the person packing the car are not always welcomed. Helpful comments are not appreciated. The trip away may not always have a happy start. The picture of the people below are NOT like any family I know before they go camping. We hope you find these tips are useful for those who might be new to car camping. If you are more the minimalistic sort of camper, then you might find this level of preparation for a camping holiday a little disturbing! Being organised for camping trips will make your life so much more simple. It really saves a lot of time in the end. One key and easy way to do this is by organising key camping items especially anything related to food. Most campers like to store key items in large plastic tubs that have strong, well fitting lids. You can buy these anywhere – at supermarkets, variety stores, hardware, and reject shops. Look for the strongest you can afford. You want ones that have good strong lids, as there will be gear and other tubs placed upon them. Make sure they lids lock on tightly. You want containers that won’t let the rain or insects come in. Clear tubs may be the best option but if you prefer coloured tubs then that is fine too. Look at getting a variety of sizes to help accommodate different contents and to utilize the space in the rear of the vehicle. Before you buy up big – check that they fit in the back of your car!! If you buy one really big container because you think you have lots of food to place in it, that is fine, but, can you get it into the car when full, and then get it out of the car? You might be better getting 2 smaller containers, which are easier to handle. So you have these tubs. What goes in them? A lot depends on how many people you will be travelling with. If you are alone, you will naturally have less food, utensils to put in the tubs. The greater the number of people on the trip, the more you need in some of these tubs. You may put in at least one food tub, all the perishable food you will be eating this trip. It’s the food items that are necessary for your meal plan, key ingredients. The reason you know this food is because of your meal plan that you probably have worked out already. We have written quite extensively about food preparation and packing food for a camping trip – that article does talk about how you sort your food and utensils for a trip. Theoretically, if you have planned your meals in advance and only brought along the foods you will use on the trip, this tub should be empty or close to empty at the end of camping. You can then use this vacant tub for storage, or put a smaller tub inside it. Those of you who travel with children, will find that all the snacks they seem to want, do take up a fair bit of room! Might contain the staples of your camping trip. For us, this is the one container that tends to stay pretty much the same every trip. It remains fully packed even when we are at home, because the contents are regularly used every family camping trip. Like the oils, spreads, coffee/tea, clingwrap, alfoil, sauces, spices, sugars etc. If this tub is not full, it can be the overflow tub of additional food items. For longer camping trips, we always need 2 tubs for food, and we do top up our food supplies as needed on the road. Stopping at a supermarket on a road trip is always an option if you need to get extra items. If you are going remote, you will need to be very organized with your food supplies. Whether or not you bring Tub 2 will depend on your menu. You may be able to combine these 2 tubs, especially on shorter trips. Your plates, glasses, cutlery, cooking gear such as saucepans, frypans, chopping boards etc. Once again, if you have planned your meals in advance of your trip, you may not have a full tub, as you only need to take what you need for the trip. Not cooking rice or pasta? Then leave the colander at home. You get the idea. More information on this is in the article of beginner food preparation. We have in a smaller tub, all the bits and pieces of camping that isn’t food. Like the washing up liquids, scourers, garbage bags, clothes lines and pegs, mallet, matches, hand sanitizer, first aid kit, paper towels, firelighters. This tub comes with us every single trip. It’s all these little things that could be so easily forgotten on their own, but by having them in one small tub, readily accessible for every trip, proves to be a big help and makes life a lot easier. We may forget other stuff, but never this tub! You may find other tubs of varying sizes for other key items. Maybe a tub for lighting equipment. Or toys. Or water sports gear. You are going to have to customize your tubs based on your needs. At this point, you may be thinking, “That’s a lot of tubs for my car! !” And you could be right. The size of your vehicle will determine the size of your tubs and the quantity. You may have to modify this to fit you. If there is a not a big camping trip planned, we can sometimes get away with using a lot less tubs. This means repacking the containers to suit our needs on that particular trip. We do this a few days in advance of the trip, once we have an idea of a menu. Before the trip, get every item you want to take on this trip in one spot, all at the same time. I mean every single thing. Every thing you will be using and you NEED in one spot. Use a checklist if you have one to make sure all items are present and accounted for. Make sure everyone who is going in that vehicle with you has done this as well. You don’t want any last minute surprises when the car is packed. People who packed the car can lose their minds if you present a last minute bag of clothes or any item, once the car is fully packed (speaking from experience on this point). It will probably scare you when you see it all together. We get scared. Now you will know exactly what you have to work with and fit in the car. Be prepared to be ruthless and say “no” to some items that aren’t crucial to the trip. Children can be notorious for trying to sneak in non-essentials. When on a driving trip you have to think about safety of the people in the vehicle with all this extra gear. You have to pack this camping gear safely and the more you pack into a car, will increase the danger. These heavy loads could affect the cars handling and performance plus increase risk to the passengers in the event of an accident. Loose items flying around inside the car become dangerous projectiles if the car comes to a sudden stop or in an accident. There is extensive information about the importance of packing your car safely to protect the occupants. 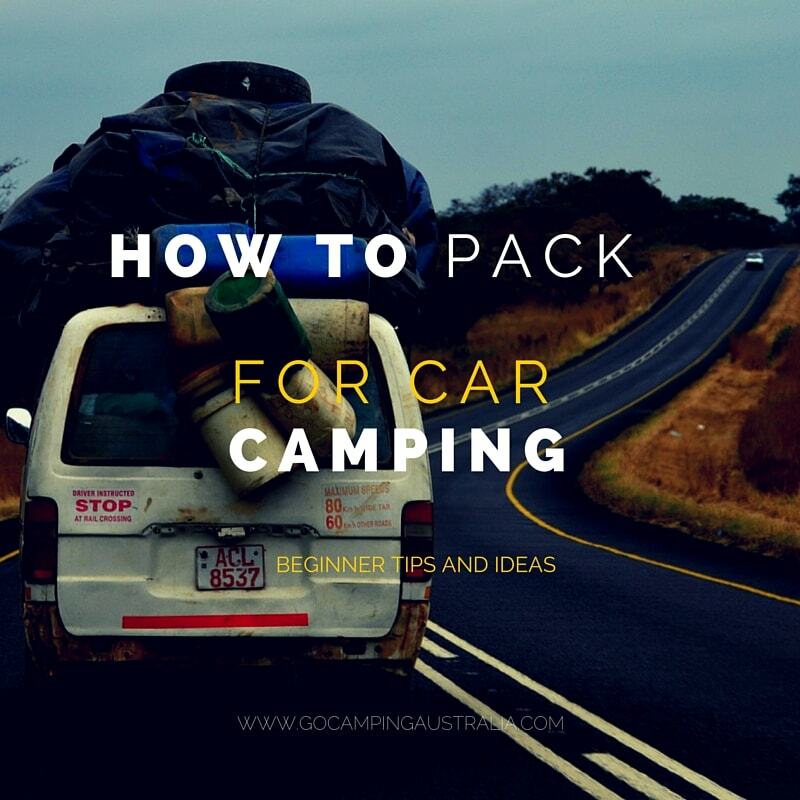 An article I think is worth reading is the 10 tips to pack your car safely by RACQ – it talks about the need to secure the items, cargo barriers, use of roof racks, adequate vision, and temperature of the car. Another article from Cambridge Journals, briefly touches on research on unrestrained cargo in the rear of the vehicle (boot, and failure of seats to keep it there). We strongly recommend that you invest in a cargo barrier if you are travelling in a SUV/4WD to protect everyone in the car. You will when packing the car, heed the advice in the above article on car safety. That’s the most important thing right now. But here are some more tips on getting the gear into your car (but don't ever compromise safety). Think about what you will need to use first when you get to the campsite. It will probably be your shelter as that is most people’s first priority chore once they have a campsite. So everything you need to set up your shelter needs to be accessible. Planning on reaching the campsite late? Then make sure the lighting is one of the most accessible items in the boot. Then think about your tarp and how easily you can get it. Or you wet weather gear. You may have to work very quickly in the rain, and you want that sort of gear handy when you pull up at the campsite. For more advice on camping in the rain, read these tips. Pack the big heavy tubs, esky, etc in first and on the bottom. It is giving a good foundation for building up the gear in the boot of the car. If you can tie down any of these large items to cargo clips, do so. The heavy gear is to be placed in the centre of the vehicle boot, which helps with the handling of the car. If the car is stopped suddenly, being low and centred and secured, prevents thrust and momentum. Put the heavy gear up against secured components of the vehicle - push the heavy gear against the rear of the seats, or up against the rear of your boot. Remember: all heavy items down low in the car. Suitcases are not ideal things to bring camping. If you need clothes bags, bring soft-sided duffel bags/backpacks. We have even used the supermarket fabric shopping bags to put clothes in – they squash really nicely into nooks & crannies in the boot. See the next tip on why these shopping bags are handy…. Even with all your tub placing, there will be holes between the gear, and that is great. You fill these spaces with all the other non-tub items. It might be a sleeping bag, or a kettle, or hiking boots, or any bits of camping gear that doesn’t have a tub of its own. No space will be wasted. The clothes stored in fabric shopping bags have been used to plug holes. You might have awkward items, such as fishing poles, and camping chairs. They never fit very well in the pack of the car. They are just odd shapes. If you can, a roof rack is invaluable for these items. Pack that sort of gear on top of your car if that is a possibility. If you can’t, then this awkward gear will need to plug holes within the boot. There isn’t a really easy option. If you are a regular camper (or want to be one), investing in a roof rack, or carrier (like Thule) can be wonderful way to have extra gear come along with you. To get some tips on how to choose a roof luggage box here. A lot can be placed up on top of your vehicle but it must be done safely. The importance of securing the gear correctly cannot be underestimated. You don’t put the heavy items on top of the car. It’s for the bulky but light items, and the awkward items. Note: Use of roof rack/carrier will increase air resistance and fuel consumption, up to 20% at higher speeds. Where the driver and passengers are, you really need to try to keep this area clutter free. It is easier said than done. Every single trip we still struggle with this. The heavy gear has to be in the boot – there is no question of that. A cargo barrier for SUV/4WD is an investment that can save lives. But in the car itself, we sometimes put soft items like pillows, sleeping bags on the back seat, or on the passenger rear floor (making sure it’s clean on the floor, and no shoes put on it). We have snacks and personal belongings with us as well. The children have their own packs full of what they need to keep them occupied on the trip, as do the parents. Try your hardest to keep the inside of the car, where people are, devoid of excess luggage. Remember in the event of an accident, every item in the car becomes a projectile that could kill. See this short story by the NRMA about the dangers. It is very difficult on long road trips, but emphasizes to you how important it is to really scrutinize what is needed for a trip, and what can be left at home. This video below, is interesting. It shows what happens in a car accident to gear inside the car (they are using a trip to the hardware shop for their unsecured belongings, but the idea applies to any loose items in the car). Your first attempt may not be successful. You could have excess gear still on the ground around you and no room left. That’s a bit concerning when it happens, so you might have to pull out a lot of gear, and start over again. Pack your car with plenty of time before departure. It’s hard to pack a lot in advance if the esky is one of the key items in the rear, and it needs to be stocked just prior to leaving home. You can place the empty esky in there in advance so you can pack around it, and then fill esky at last minute, and complete the loading of your boot. If and when you are successful, it’s like a jigsaw puzzle that has been completed. But you got it all in there, but what happens for the return journey? Grab your smartphone, and take a quick photo of how it looks. It could be a reference for the homeward bound journey, so you know roughly what it looks like. You may be able to improve on the next attempt! There you have it. Some easy tips that you can do when you are new to camping. Lots of stories will discuss minimising your gear for a camping trip, and that is a lovely idea but it's not always going to happen or be possible (especially with young families). We hope that the above information will help those of you who can't always downsize, and is a realistic portrayal of the complexities in packing for a car camping holiday. Like this story? Then subscribe and get more stories like this one in your inbox.